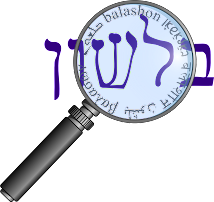 Do you know anything about the word גלידה? (glida , ice cream). Was it totally made up or based on some actual precedent in Hebrew? For those parasha sheet readers in Israel, this question has been addressed a couple of times in Torah Tidbits. But I'll try to give a little more detail here. According to Klein, Eliezer Ben-Yehuda coined the term glida for ice cream from the word גליד glid - meaning ice, on the analogy of leviva לביבה - pancake. Glid appears in Hebrew in the Mishna (Ohalot 8:5, Mikvaot 7:1) and an Aramaic form - גלידא glida - is used as a translation of kerach קרח - ice by Onkelos on Bereshit 31:40. Glid, in turn, derives from the root גלד, meaning "to freeze, congeal, to gel." Klein writes that this root is probably denominated from geled גלד skin, and originally meant "it was covered with skin." The verb הגליד means "it formed a crust, formed a scar". Geled appears once in the Tanach - Iyov 16:15. Stahl adds that there are two roots in Arabic which mean "to freeze": ג'לד and ג'מד. In Semitic languages lamed and mem can alternate. In Hebrew גמד means "to contract, reduce", and in Modern Hebrew a gamad is a dwarf. (The word gamadim גמדים appears in Yechezkel 27:11, but is referring to the name of a nation. The Daat Mikra says they're related to Gomer גמר, with a switch of dalet and resh. Kaddari says they came from the city Kumidi. However, the Vulgate translates Pygmaei - which fits the modern idea of "dwarfs".) Stahl suggests that the growth of a gamad is "frozen". Literally: The third time, ice cream. Without knowing what this is talking about, one would really wonder... It is referring to chance meetings between people. If you have run into someone by chance and then once again by chance, at that point, you might say "pa'am shlishit glida." This means "the next time we meet, we sit down for ice cream." The question that always comes to my mind with this phrase is who gets to pay? There is no implication in the phrase about being the one to buy the ice cream, so you don't have to worry about any obligation by saying it. On the other hand, there is one opinion that says that s/he who hears the phrase will be the one buying it. By the way, this phrase is not literal. It is NOT an Israeli custom that upon meeting for the third time people immediately find the nearest cafe/kiosk and sit down for ice cream. Or the converse: When you see two people enjoying ice cream together, do not assume it is because they ran into each other three times by chance. Rosenthal has a couple of suggestions as to its origin. One is that it comes from the English phrase "third time a lucky charm" or "third time lucky". But the problem here, as pointed out in this thread, is that it "contain(s) the assumption that the first two tries were unsuccessful." Rosenthal also tries to derive it from "next time ice cream" - a mistaken version of "next time I scream", or as this site has it, "third time I'll scream". Problem is, that no one actually says "next time I scream" or "third time I'll scream". In German we say, "nächstes Mal gibst du mir einen aus", i.e. "next time you'll have to buy me a drink". Meant as a jocular suggestion that such a coincidence must be celebrated - but, to be sure, at the expenses of the other person. However, this still doesn't explain the "third time" aspect in Hebrew. Maybe a reader can help us out?